Here is the cover to my book! Pretty excited. The whole editing process has been eye opening – so many layers. But my fears were calmed a bit when one of my professors told me that every book has mistakes. Let’s just hope mine is not overrun with typos! My goal was to make Hope and New Orleans intelligent, accessible, and entertaining. I wanted to tell stories that people who were not familiar the city with could enjoy, but also add some flavor and find facts, anecdotes, new perspectives for those who were familiar with some of the classic New Orleans stories. I hope I succeeded. If you want to pre-order, here is the AMAZON LINK! deep breaths… deep breaths… deep breaths. 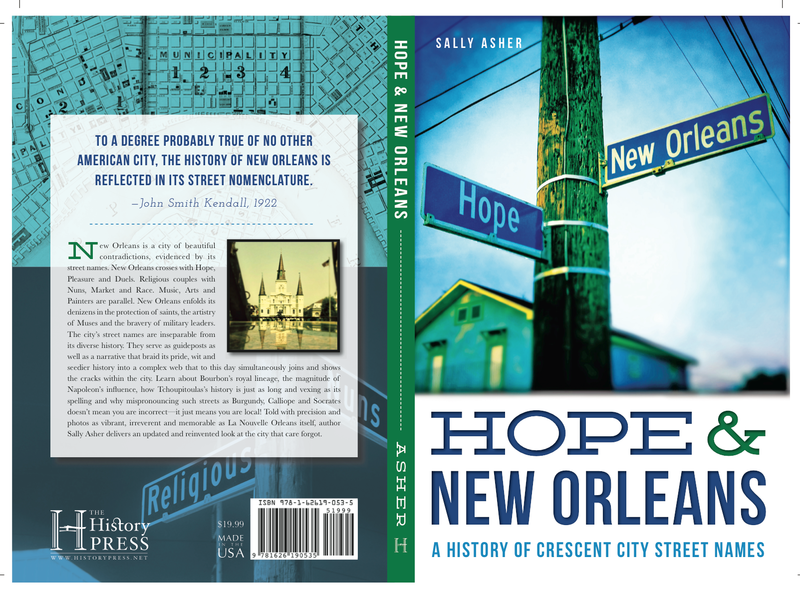 This entry was posted in History, Hope and New Orleans, New Orleans, Photography, Research and tagged asher, book, crescent city, history, history press, hope and new orleans, New Orleans, Photography, photos, research, street signs, streets. Bookmark the permalink.